Prominent & Leading Manufacturer from Thane, we offer grease plant. Purity -Complete absence of corrosive or abrasiveIngredients that would be harmful to Bearings. Only highest quality fats are recommended to obviate rancidity. Uniformity -Raw materials and finish products qualityControl, Uniformity in process Parameters, consistency in all physical and chemical properties. Lube oils and Recommended are carefully selected to give excellent lubrication characteristics. The process parameters have been finalized and adopted after large number of Production batches. Stability -Retention of homogeneity throughout their use and in storage. Extra Qualities -Extra desirable qualities have been imparted toThe greases – either by way of special manufacturing processes or by Addition of necessary additives. 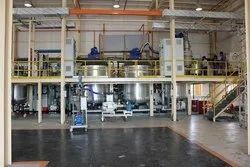 Looking for Grease Plant ?